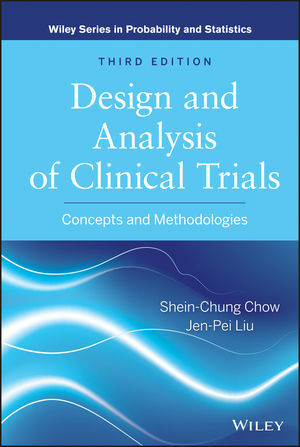 Design and Analysis of Clinical Trials, Third Edition continues to be an ideal clinical research reference for academic, pharmaceutical, medical, and regulatory scientists/researchers, statisticians, and graduate-level students. SHEIN-CHUNG CHOW, PhD, is Professor in the Department of Biostatistics and Bioinformatics at Duke University School of Medicine. JEN-PEI LIU, PhD, is Professor in the Department of Agronomy and Institute of Epidemiology and Preventive Medicine at the National Taiwan University. He has authored multiple articles and books on clinical trials and been involved in clinical trials as a biostatistician for more than twenty-five years.